The OxiClear™ Gas Purifiers are oxygen-absorbing gas purifiers with high efficiency and low resistance to gas flow. OxiClear™ Gas Purifiers are primarily designed for applications involving gas chromatography, glove boxes and anaerobic experiments. They remove oxygen and trace amounts of water and organics from inert carrier gasses such as nitrogen, helium and argon. OxiClear™ purifiers are efficient to less than 1 ppm when the incoming oxygen concentration is 10 ppm or less. Furthermore, all the disposable models can withstand temperatures up to 100°C and the refillable models up to 200°C. All models are fitted with 60 micron stainless steel frits. If you want oxygen outlet concentration in the ppb range, please contact technical support. The OxiClear™ Gas Purifiers are offered in a large variety of designs and configurations. The OxiClear™ Disposable Gas Purifier is offered in the "inline" configuration, with either 1/4" or 1/8" brass male tube compression fittings. It is capable of purifying the contents of 1-2 standard cylinders of 300 cubic feet, easily removing oxygen from inert carrier gasses down to less than 5 ppb. 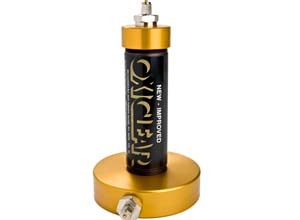 Offering a very low resistance to gas flow, .03 psi/(cc/second), the OxiClear™ Disposable Gas Purifier will deliver 100 cc/second at a pressure drop o: only 0.3 psi. Flow rate to 5 liters per minute. Now you are sure when your O2 purifier is expended and needs replacement (or refilling, if using a refillable model). Simply install the Indicating Oxygen Trap after the OxiClear™ purifier. When the color of the Indicating Oxygen Trap turns from light green to grey, it is time to change both the purifier and indicator. No more calculating or guesswork. This safe, compact unit has a capacity of 40 cc of pure oxygen; it will remove oxygen from a full 200ft 3 cylinder helium with 10 ppm oxygen (or several cylinders of high purity helium). The heavy-walled inner glass tube of catalyst is protected from accidental breakage by the outer plastic tube. Maximum pressure is 100 psi. The Indicating Oxygen Trap is delivered in the active state, filled with helium. We recommend that the trap be purged before use with the gas you will be using. Approximate dimensions: 1 3/8"x 10 including Nickel-plated brass fittings. All stainless Steel purifiers are made of 304 Stainless Steel, and are rated at a maximum operating pressure of 1800 psi (3000 psi upon request).